Linlithgow Rose have fingers crossed they can come out of cold storage this weekend and finally play their Scottish Junior Cup tie at Oakley. Boss Mark Bradley and his players are hoping the weather will relent and allow the third round tie to go ahead at the fourth attempt. But if it does Linlithgow will have to take on their Fife lower league opponents without the services of midfielder Owen Ronald. The 24-year-old is likely to be missing for several weeks after being hurt in an accident at work. Ronald’s absence is a major blow for Bradley. 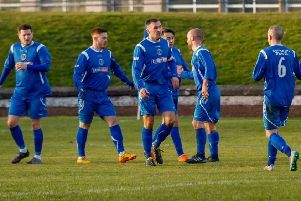 Since arriving at Prestonfield during the summer his forceful midfield play and regular supply of goals have been major factors in Rose’s revival. Ronald has found the net nine times so far this season - making him joint-top scorer along with Tommy Coyne. And Bradley conceded his absence will be a setback for his side, as well as for the player himself. He said: “He’s got a cut on his arm, he’s broken his left hand and has got a bang on his knee so he’s a bit bruised and battered and needs a bit of rest and recovery. “It’s not ideal for the boy and he’s gutted because he was on a good run of form. “He’s been one of the main players in the team with his contribution so he’s going to be a miss. But with Owen stepping out it gives someone else a chance and that’s what you have a squad for. It’s been a frustrating time for Bradley and his players with the Oakley tie called off three - so far. Junior bosses have now decided that the next two Saturdays after this week - December 23 and 30 - can be used to clear fixture backlogs. And Bradley feels that will cause further frustration for players and clubs who had originally thought there would be a festive break after this Saturday until the first Saturday in January. He said: “There’s been a bit of a to-ing and fro-ing on that one. We thought we were going to be off and then they gave us a game against Bo’ness on the 30th at Linlithgow. “The Scottish Cup game will obviously take precedence over everything until it gets played but it’s a bit of a nightmare. It’s not difficult to organise fixtures when you have Saturdays that are free but we always seem to make it difficult and confuse everybody. “With a shutdown mentioned weeks ago there are a couple of boys that have got things organised over the New Year weekend so that is frustrating. You want to be at full strength and it’s not ideal.